what is the limit. The limit is what value the function approaches when x (independent variable) approaches a point. takes only positive values and approaches 0 (approaches from the right), we see that f(x) also approaches 0.
itself is zero! Why? Because of our understanding of limit. No matter how x approaches 0, f(x) approaches 0 when x is near 0. 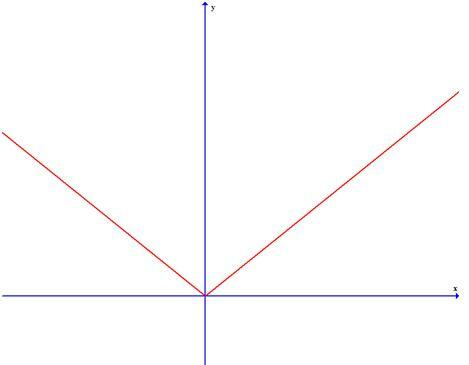 The same argument may be used to prove the limit of other functions with corners similar to this one. exist at corner points. This is explained, once again, using an intuitive idea. related to the existence of a tangent line. But just imagine, how many tangent lines can you draw at point x=0? Infinite! There isn't "a" tangent line. So, the derivative does not exist at that point. Join in and write your own page! It's easy to do. How? Simply click here to return to Your Questions About Limits.